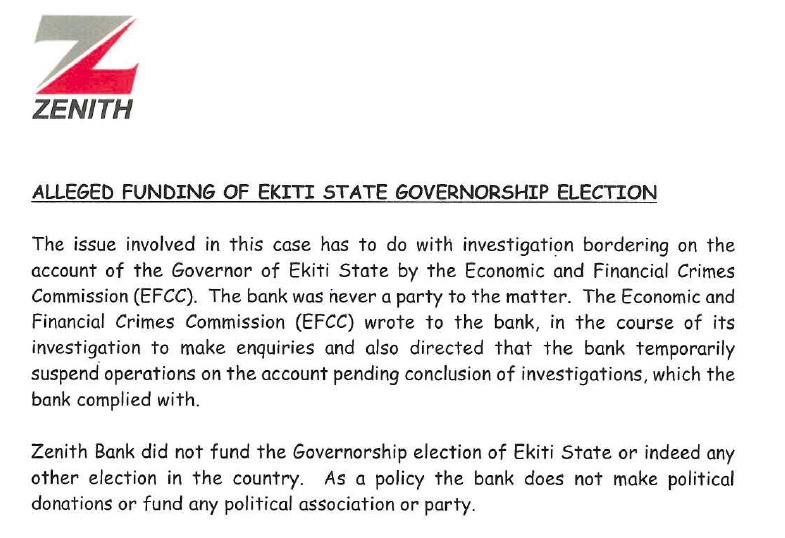 According to Sahara Reporters, Zenith Bank has categorically denied any part in the funding of the 2014 governorship election effort of now Ekiti State governor, Ayo Fayose. 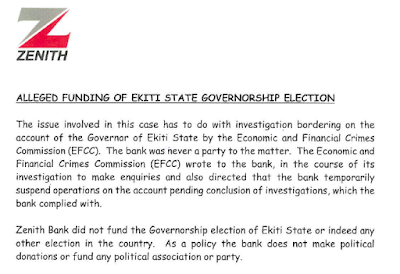 In a letter of Disclosure to the Nigerian Stock Exchange (NSE), the bank said it did not fund the election which returned Fayose to power as governor, nor any other election in the country. “As a policy the bank does not make political donations or fund any political association or party,” it said in response to an administrative inquiry by the NSE. It added that as a financial institution, it only maintains a very cordial relationship with the authorities of all States where it has business offices, including Ekiti. The bank stated that it will continue to conduct its business in line with best practices and extant banking laws and regulations. 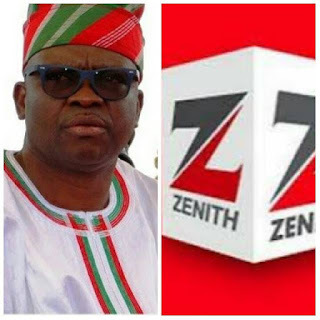 It would be recalled that on June 22, Governor Fayose declared that his governorship run had been funded by Zenith Bank Plc and other private donors as he tried to challenge claims by the Economic and Financial Crimes Commission that funds of the office of the former National Security Adviser, Sambo Dasuki (retd), had been deployed in the campaign. In his account, the governor said, “The management of Zenith Bank, which majorly funded my election, called me to a meeting where I was assured that the fund would be provided for my election. I was asked to nominate a trusted ally to be related with and I nominated Mr. Abiodun Agbele.